Our Daphne Office Chair features a walnut veneer finish seat and black Leatherette. The cushioning provides both stability and comfort, and the 360 degree swivel makes maneuvering the chair easy around the office. Black plastic caster wheels are affixed to the bottom of a chrome-plated steel base and adjustable height gas piston. 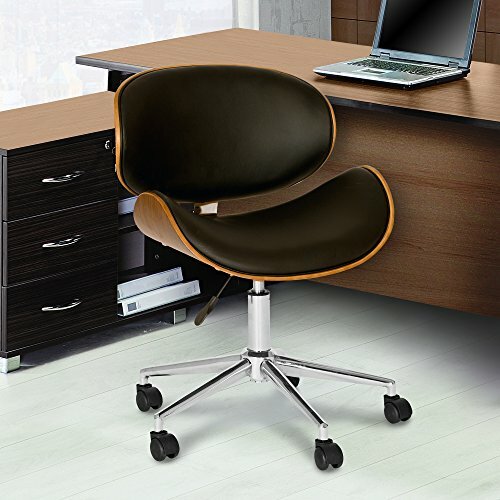 This mid-century and modern design mix adds a unique style to your office and breaks the rules of typical office seating. If you have any questions about this product by Armen Living, contact us by completing and submitting the form below. If you are looking for a specif part number, please include it with your message.